Talk of greenways putting farmers “out of business” and “destroying” farms is over the top — coming from the the Irish Farming Association, it’s also irresponsible. The Connacht Tribune reported yesterday on a meeting of farmers which discussed the Galway to Dublin greenway. The newspaper said that Galway IFA Chairman stated that there would be absolutely no cooperation from farmers for this project until the word CPO (compulsory purchase order) was taken off the agenda. “[CPOs have] involved ESB lines, gas pipeways and new roads but to destroy a commercial farm for a walkway is just something that farmers will not accept. This is not critical infrastructure and there are alternatives available,” said Pat Murphy, Galway IFA Chairman. The Great Western Greenway (pictured above) shows that such routes can coexist with farming work and access, and enhance country life. Local people living in the countryside are given a safer place to walk and cycle — young children can cycle to their friend’s house or even possibly to school. While CPOs were not used on the Great Western Greenway, the route has been compromised a number of times over disputes with the council which has nothing to do with the greenway. Greenways are too critical to be treated like this and allow the safety issue of forcing families and other unexpecting users out onto busy, narrow, high-speed roads. Just as it controls the road network, the State must control the National Cycling Network. It is a misconception that compulsory purchase orders (CPOs) are only to be used for “critical infrastructure” (a term used for such infrastructure which can bypass the normal planning process). CPOs can be used for any project by authorised state bodies where the projects are clearly for the public good. Walking and cycling routes are clearly for the public good and, in this case, the Galway to Athlone section of the road is for the national good. The greenway could even be described as a critical link at the western side of the Dublin to Galway route, which uses the Royal Canal towpath from the Liffey in Dublin to Mullingar in the midlands, and then the disused Mullingar to Athlone railway (see map below). The Dublin to Galway greenway is clearly for the public good — it has massive tourism potential which will be a boost to the national economy and local areas all around the route. This can range from international tourists cycling the whole way from Dublin to Galway, to international and domestic tourists cycling shorter distances while staying in local hotels or B&B, or just day trippers who stop in local shops and cafes. It will also have local and regional health benefits in offering residents near the route an attractive place to walk and cycle away from roads with fast, polluting and noisy motor traffic. It does not stop there. The route also has the potential for short and long distance commuting by bicycle. Typically the commuter would be mid-short distances — think commuting into Galway city, or commuting into Athlone, or one of the many towns or villages along the greenway. Why would people go by bike? Maybe they would be students going into Galway or Athlone and want to save money. Maybe an office worker wants to get fit. Or any number of workers wanting to avoid the stress and congestion of Galway’s traffic. There’s many reasons — a greenway can offer people a way to unwind after work, or it can be an alternative to infrequent, costly and limited public transport. O’Brien seems to know little about greenways and his words are misleading to the IFA’s members and others. Old national roads are not suitable for a greenway aiming to offer walking and cycling away from motor traffic and, in fact, in the most stunning landscape possible. It’s unclear how he thinks that a greenway, which is only a few meters wide, could have such a strong impact as to put farmers “out of business”. We’re talking about the width of a very small road — while the IFA reps are making it sound like a motorway of nearly 40 meters wide, with no level crossings, and no chance of using the route for farm access. This is far from reality of such cycling and walking routes in this country and elsewhere. The best way to ensure the least impact on farms is to engage with the planners of the project. Objections to CPOs in the courts should not be looked on well if the farmer or other landowner has not engaged in the planning process. If a farmer is worried that the walking and cycling route will split their fields in a damaging or overly inconvenient way, they should make their case to the route’s project team. If critical farming links would be cut off by the routes, measures should be put in place so that does not happen and the route diverted if needs be. If they are not listened to then they can make an objection when the route goes to formal planning to be approved or not. It’s only after that process, when the CPOs are issued a legal can challenge be made. So, a lot of stress and money can be saved by engaging now. Built right, walking and cycling routes should can be designed to enhance access to fields and farms. The Netherlands offers examples of this on a large scale — where routes double as access roads and rather than needlessly having tractors on main roads. Farmers should also be be rightly compensated for any lands compulsory purchased by the State. This not only includes the value of land but also future income which would be lost because of the CPOing of that land. If any TD or councillor wants to stand up for farmers, they would be right to look for fair and reasonable payments, and good access to farmland. But it would be wrong to try to exclude the use of CPOs and it would be worse to try to get the State to pay an excessive amount. Rural groups and representatives talk about the west of Ireland being neglected and underinvested in. 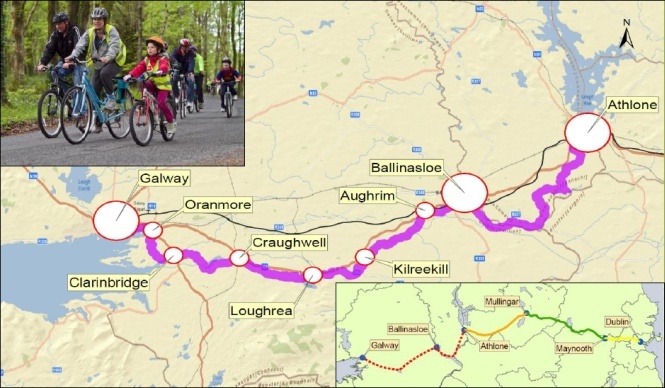 Greenways are an investment in rural Ireland and this greenway is an important tourism link for the west of Ireland providing an offering for short stay guests to long-stay, high-value tourists who will cycle on planned routes to western Galway and even onto Mayo and possibly Sligo and further north. It’s a link of great national importance. It seems an awful indirect route from Athline west. Particularity if cpos are to be used, a more direct and shorter route should be used, closer to Athenry. @Colm — it’s mainly a tourism route focused on getting in as much scenery / tourism focal point as possible. I have some sympathy for the farmers but to say “this is not critical infrastructure” is narrow-minded in the extreme. Continuous, safe, high quality walking and cycle routes have massive potential for local communities and are very definitely in the public interest (not to mention the fact that they’re excellent value for money). Closing underused and/or strategic public roads to through motor traffic should, of course, always be considered. It’s a sad indicator of the nation’s attitude to cycling that the only areas that can be dedicated to it are undeveloped, recreational and wild areas. It would be preferable to have direct links and extensive networks both in and between our towns and cities. It seems to be more politically possible, however, to develop new cycling routes rather than reclaim space from private motorised transport. is there no existing/old infrastructure that this path will be on? There’s nothing like the canal and disused railway between Dublin and Athlone. The old main road is unsuitable (design, traffic) and so is the active railway (even where there is clear space it’s reserved for long-term double tracking), and both are not seen as optimal for a tourist-centric route. extremely disappointing that people show such disrespect for the farming community. for farming practices to be disturbed in this way is shocking. For young animals to be subjected to the to-ing and fro-ing of cyclists, pedestrians cutting through private farm land is UNACCEPTABLE. It just goes to show how little knowledge some have about safe farming. From a health and safety perspective, it is unacceptable too. please leave our farming communities alone. they are subjected to ongoing attacks and abuse at times and here is another example of blatant disrespect. I strongly agree with Ivan above. The idea of having people directed through farmland is so unsafe. There is a complete disconnect with the realities and dangers of farms and farm animals. Cattle are not tame animals, they can be extremely dangerous when with calves. There will be nothing to stop people trespassing on land to look at animals and potentially getting hurt. It will be the farmers insurance that will have to cover any such incidents. The community between Ballinasloe and Loughrea have already had a gas pipe line, a motorway and a dump forced on them in the last number of years. Can people not leave this community in peace. Farms have been torn apart already by the Galway to Dublin motorway here, the same communities and some of the same farmers will now be affected again. Everyone is willing to do their bit to advance infastructure but this is just too much. There is no respect for our community. Roads in this area are appalling and have been for years, locals have been told time and time again there is no money to fix them, yet millions of euro can be found to build a cycle track in the same area. In response to James and Ivan, a lot of the issues that you are raising apply to public roads in general which, after all, are free to be used by pedestrians and cyclists anyway. The status quo, whereby these vulnerable users are scared off using public roads due to speeding motorists is unacceptable. The condition of local roads all over the country is appalling. But the proposed infrastructure is relatively modest in cost and scale and unlike the gas pipeline or motorways will stand to benefit local communities greatly.